and I dare a little more as I grow older." This Friday finds me sleeping later than I planned in the lounge at the airport in Stockholm, on my way to Paris. To the great applause of readers all over the world this may be the shortest letter in 12 years. I will write here and on the plane and quit when I land so I can be with friends this evening. No time for exhaustive research, so we will march through random topics that caught my attention this week until it is time to hit the send button. In no particular order, let's jump in. I was brought to Stockholm to speak for Swedbank. They arranged for me to meet a wide variety of local people, as well as to have dinner with readers. I talked with a number of people who were in positions of authority during the Swedish credit and debt crisis of the early 1990s. And a crisis it was. The currency was under attack, as the fundamentals were negative. This was at the same time that Soros was attacking the British pound. Interest rates had been rising in Sweden, but the financial environment was being loosened. This meant that Swedish businesses and consumers could borrow in foreign currencies that had much lower interest rates, and borrow they did. The central bank made it very clear that they would protect the value of the currency, and everyone believed them. Remember, this is a relatively small country, and basically everyone knows someone who at least knows someone who was involved with the central bank. The central bank was adamant in its belief that it could protect the value of the currency, and it raised rates by 500% in order to do so. Why such a fetish for a strong currency in a country that was driven by exports? Because their past experience had dictated that not defending the currency was the wrong thing to do. My guests went into detail about Swedish history (which I found fascinating), explaining the thought process at the time. Just as hyperinflation in the 1920s had scarred Weimar Republic Germany, leaving that nation with a visceral reaction to loose monetary policy, the history of Sweden had colored Swedish views as to appropriate monetary actions. That seems to me the classic problem of generals always fighting the last war in their planning," I said. "Precisely," came back the quick answer. To even mention publicly that "maybe we should allow the currency to float or weaken" invited late-night phone calls from the leadership, raising the question of the individual's future participation in polite circles. Ultimately, of course, the market dictated that the currency could not be kept at artificially high rates in either Sweden or Great Britain. The Exchange Rate Mechanism broke down. The Swedish Krona was allowed to float and overnight dropped 21%. Which meant that the incomes produced in Sweden to pay the interest on foreign loans dropped 21% in relationship to interest-rate costs. Property was immediately less valuable in terms of the currency that had been borrowed to pay for it. Unemployment soared as a recession hit. The government deficit rose overnight to 10%, as there were less tax revenue and higher unemployment costs. Government debt rose, and the bond market wanted higher interest rates, which of course made the situation worse. "Let me guess. Most of the larger businesses and investors saw the crisis coming and protected themselves. The smaller people and businesses were hurt the most." My hosts (who, even though younger than I, were at that time already in responsible positions) had all lived and suffered through those times. And they all smiled and nodded yes. Well, they remembered, as they talked among themselves, that there was one large company that believed the central bank up until the end, and it went bankrupt. Interestingly, no matter the politics of the persons I talked with, there was universal disagreement (if not disdain) with how the US had handled its recent banking crisis. "We did it much differently and it proved to be the right way. If a bank wanted government help, the government said 'Sure. No Problem. Just give us all your private equity.' Shareholders were wiped out in exchange for government help." They recalled that bankers did everything they could not to fall into the gentle hands of the government. But if they did, the government took the assets and put them into a good-bank and a bad-bank pile. Typically, the assets that were under water were real estate-related. As an aside, as the government sold the assets after some time and ended up not losing on their real estate portfolio, which shows the value of being patient money in the middle of a crisis. If we had only had Swedish socialists running our TARP program. And speaking of Swedish socialists, if someone tried to introduce their "solution" to the Swedish equivalent of our Social Security program in the US, there would be weeping and wailing and gnashing of teeth in both parties. It would be deemed the end of the world and heartless cruelty. Sweden's system is set up as a "pay as you go" model of social security. What current retirees get is a direct function of what current employees pay. If during a recession the revenue goes down, then the social security payments go down. You can actually have a case where your retirement pension goes down within a given year rather than up, if the country is in recession. In essence, their social security costs are indexed to GDP. They can never run a deficit in the program. I suppose they could raise the tax, but there seems to be little appetite for raising taxes. There was some clear chafing at being labeled a socialist nation, which most of us in the US think they are. "We could teach you a lot about being responsible socialists" was the universal response. "In many ways, we are less socialist than you." Going back to the crisis, many remembered reading a report from a major European group, talking about how Sweden was doomed to years of depression and endless malaise. Yet within a few years Sweden was again growing, as those socialists got their government act together, and the country has never looked back. From a very large debt-to-GDP (I can't recall the exact number, but was indeed large [and there is no internet on Air France]), it is now between 30 and 40%, much more like that of an emerging-market nation. It helped their recovery that they had a strong export sector, which was aided by a drop in their currency valuation. They now run surpluses everywhere, and their currency floats. While Europe went into a recession with the credit crisis and is once again rolling into recession, Sweden has grown, albeit slowly. "Europe Short of Magic Wands"
That was the headline in the European version of the Wall Street Journal. The front-page headline was "Data Suggest More Woes In Euro Zone." The Purchasing Managers' Index was down, against expectations. " That is hardly a surprise. Italy is projected to contract at 1.3% this year. Spain is in recession. Germany and France are barely growing. Spanish interest rates are rising in spite of ECB action, with Spanish rates now above those of Italy. Spain has been a major topic of discussion here in Stockholm. The conference I spoke at was attended mostly by large asset managers, both fixed-income and equities. Some rather savvy managers were openly wondering how Spain could solve its current woes. The country is in recession. Unemployment is 20% and 50% among youth. The deficit is now projected to be 5.8%, up from the target the previous government agreed to. The EU is not happy with the new Spanish government, which signed the new fiscal agreements only to turn around in a few days and increase its projected deficits. How can Spain enter into anything approaching a Greek-like austerity program? Its private sector debt is over 200% of GDP, and they are being forced to deleverage. If the public sector attempts to do so, it will make GDP much worse in the short term, which will increase unemployment. Spanish Prime Minister Mariano Rajoy is in a no-win situation. ( Click here) If he cuts the deficit too much, he risks a deeper recession and a corresponding decrease in tax revenues (and rising unemployment costs), which of course makes the deficit worse. For an example, look to Greece to see how well such policies work. But if he tells the EU to forget their deficit targets, he risks not merely their ire, which he can deal with, but the possibility that they demand a more austere budget in return for assistance. One of my hosts suggested that Rajoy is in control and can do what he wants. I disagreed, noting that he is in a serious game of poker. He only has access to the bond market at rates that are even close to being sustainable as long as the ECB is buying Spanish debt and funding Spanish banks, which are buying Spanish debt with complete abandon. Spanish banks raised their holdings of Spanish government debt by more than 10% in both December and January, a larger increase than for any other banks in the various nations of the eurozone. There is no reason to think that trend did not continue in February and this month. Rajoy has pushed all of his chips toward the middle of the table in a gamble that the rest of the euro zone, and most notably Germany, will not really try and force Spain to take serious deficit reduction measures too quickly. "How can they force them?" I was asked. "Very simply. They simply tell the ECB not to fund Spanish debt below a certain level of interest rates. Indeed, the recent interest-rate rise, well above that of similarly beleaguered Italy, may be more than a coincidence. It may be a less than subtle reminder to Rajoy as to who is in real control. Without ECB help, Spanish bond rates start to look like Greece's, and the end quickly approaches. The only options at that point are default and/or leaving the euro zone." Which is of course the hand that Rajoy is holding. "Push me too far and let's see how you like a real banking crisis," as the "D" word (default) enters the Spanish vocabulary. THAT would create huge headaches and sleepless nights in capitols all over Europe. Rajoy is betting that Merkel will blink. While Europe can afford to lose Greece and even poor little Portugal (although there is a great deal of nostalgia and sentimental opinion when it comes to Portugal), for Spain to consider a European exit calls into question the whole euro zone project. Will European (read German) voters agree to large bailouts of Spain? And large they would need to be. Can the banks and the ECB live with even a small debt haircut or payment holiday of Spanish debt? That is one of the more intriguing games of international negotiations being played today, far more interesting than Greece ever was. The conclusion to Greece was easily seen in advance. It is not clear what happens with Spain. Can Merkel get the German public to go along? Will she willingly buck her voters if it appears they won't? Will Rajoy hold his ground in the face of the costs of either default or exit? Once you start the default game, you had better cut enough to get to sustainability for some time into the future, unless you get ECB agreement to buy future bonds, because the private bond market will disappear. We are once again to a point in Europe where there are no good choices, only very bad ones. But this time it is with a country that actually makes a difference. (No slight intended to Greece, but you are just small.) Spain has no good way to cut its deficit without things getting worse. But Europe must be willing to then fund Spanish debt, even if "only" through more LTRO actions by the ECB. This is a topic we will sadly be revisiting on many occasions. Stay tuned. 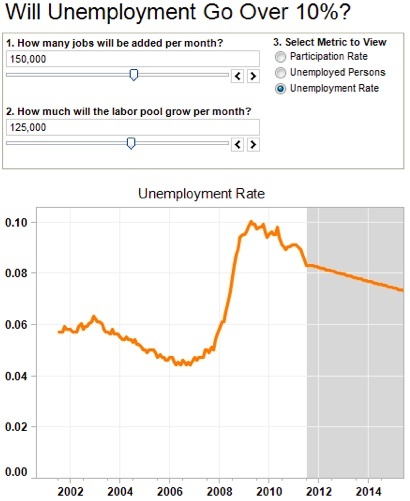 What Will Be the US Unemployment Rate Prior to the Election? A presidential election with an incumbent US president running is more a referendum on the sitting president than it is a true choice between two individuals. I see no reason that the coming election will be any different. I am on record as saying that if unemployment is over 8% and rising, I think Obama loses. If unemployment is at 7% or below, I think Obama wins. In between 7% and 8% it becomes a toss-up. So what will employment be? I came across a great interactive chart (courtesy of my friend Mike Shedlock) from Ross Perez at Tableau Software. 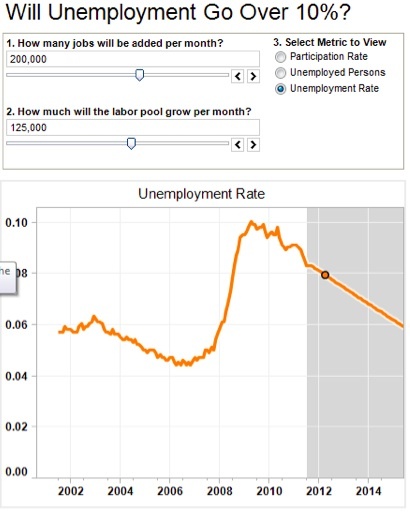 You can choose what you think the jobs growth will be and what the increase (or decrease) in the pool of available workers will be, and the graph will give you the future unemployment rate (out to 2015). As I have written in the past, it is an odd fact that the Bureau of Labor Statistics does not consider you unemployed if you have not looked for a job in the last four weeks. Or if you took a job for a short time working on your neighbor's lawn. To my mind, a job, even if temporary and for very low pay, is a job, for statistical purposes. And the BLS is, after all, charged with giving us statistics. Because people got discouraged during the recent Great Recession, they stopped looking for jobs, and thus were not counted as unemployed. Millions of people were considered "no longer in the work force and therefore not unemployed." If it was not for the loss of people counted as unemployed, the current rate of unemployment would be over 9%. Does that seem mean-spirited or politically motivated (don't I just want the number to be worse than it is?) to simply point that out? But how can we really know? I will admit to not calling tens of thousands of homes and doing my own survey. But then, luckily, I don't have to. The Gallup poll people also do a phone survey to US households. In fact, if memory serves me correctly, they use a methodology that corresponds to what any person living in the real world would use ("Do you want a job? "), and anyone but a BLS statistician would think that was reasonable. And Gallup finds the unemployment to be (drum roll) … 9%. As most economists who work on such numbers will tell you (including Ben Bernanke), the number of jobs needs to grow by about 125,000 a month just to keep up with population growth. What will job growth be in the next 8 months? Will it be over 200,000, as it has been the last 3 months? Will it be 160,000, as it was the in 2011? For those who are not on the internet as they read this, I will offer two charts with those assumptions. Are you more optimistic about job growth? Then put in your own number. How many new jobs will be needed if those who are not counted as unemployed decide to look for a job? In February, there were 476,000 people who decided to look for jobs and re-entered the employment world. The household survey actually showed a much larger increase in employment than the establishment survey, which can be seen as quite bullish. People were thinking there was actually the possibility of finding a new job and decided to look. If you want to be bearish, you can see a very distinct correlation between the rise in the workforce and the end of unemployment benefits. The truth is probably somewhere in the middle. The data that keeps coming in seems to be pointing to an improving economy, albeit improving more slowly than is normal this far into a recovery. But if you look at last year you find the three corresponding months saw above-average growth. Could we expect to see a continuation of 200,000 new jobs per month? I had this chart in my letter last week, without the total annual numbers, which Mish kindly added, so let's use his chart. 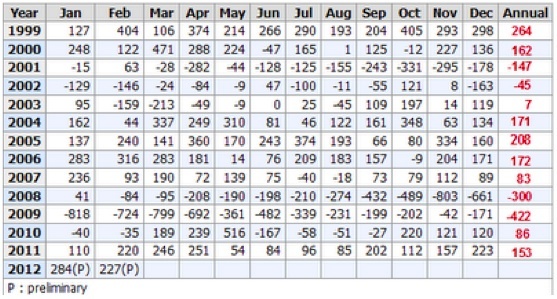 Notice that the six months preceding November did not even average 125,000. If that pattern repeats, then we will likely see unemployment rise slightly. • "At the height of the internet bubble with Greenspan stepping on the gas out of irrational fear of Y2K problems, the economy managed to gain 264,000 jobs a month. • At the height of the housing bubble in 2005, the economy added 208,000 jobs a month. • At the height of the commercial real estate bubble with massive store expansion, the economy added 172,000 jobs per month." So how many jobs do you think we will add in the next 8 months? If you ask Rich Yamarone of Bloomberg or David Rosenberg, you will get a number on the low side. Any number of other economists will give you numbers on the much higher side. It all depends on your assumptions. Plus, as I noted about 4 years ago, as people come back into the labor force, as happened in the recession after 2002, it gets harder to lower the overall rate, even as the actual number of new jobs is quite good. It is a function of what assumptions you use when you create your statistics. So, let's make some assumptions: the next chart shows what 200,000 new jobs per month and a labor-force growth of an average of 125,000 new workers per month would look like. Unemployment would drop to 7.86% going into the election. Then let's assume a lower number, only 150,000 new jobs per month (which is more than in the 8 months preceding last November). Unemployment falls slightly to 8.12%. We have to add 350,000 per month to get back to 7% by the end of October. NO ONE thinks that will happen. It looks like a toss-up election to me, at least at this point. And now I am in Paris and dinner is calling, so time to hit the send button. IS THE LATEST GOLD MOVE A BREAKOUT ? I got a monster e-mail from Nick Laird late last night...and thought all the charts, plus everything had to say in association with them, was worth posting....so here goes. "The gold oscillator is indicating that the latest move up by gold is a breakout. "There is good probability that gold has finished it's decline and the next wave should be up and taking out the recent highs at $1,780. "On a larger scale, the impending move up - if it is strong enough i.e.. takes out $1,800 & then $1,900 - will then trigger a massive rise out of the triangle shown in the chart below. 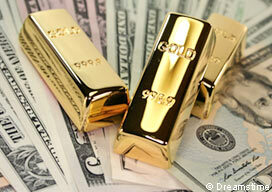 "This is indicative of a major rise coming in gold - something strong enough to take us up to the mid $2,000's. "The first rise up off the bottom was from $1,520 to $1,790 - a rise of 270 or 17.7%. We are now down at the retest level and should move up from here so a 270 rise up from $1,640 will take us up to $1,910. "We will in all probability see a larger rise here i.e. larger than 18%. "With that rise we retest the all time highs & break through. 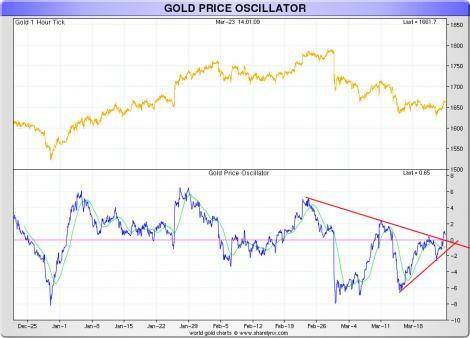 This will trigger the breakout on the Long Term Gold Oscillator giving us the buy signal for the next leg up to $3,500. 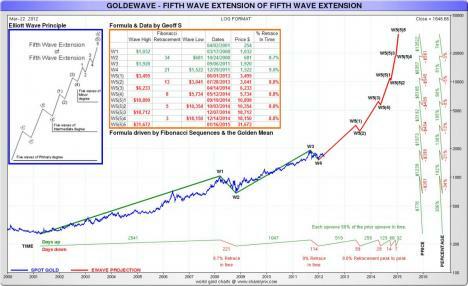 "The last major wave up took us from $700 to $1,900 in 2.5 years. 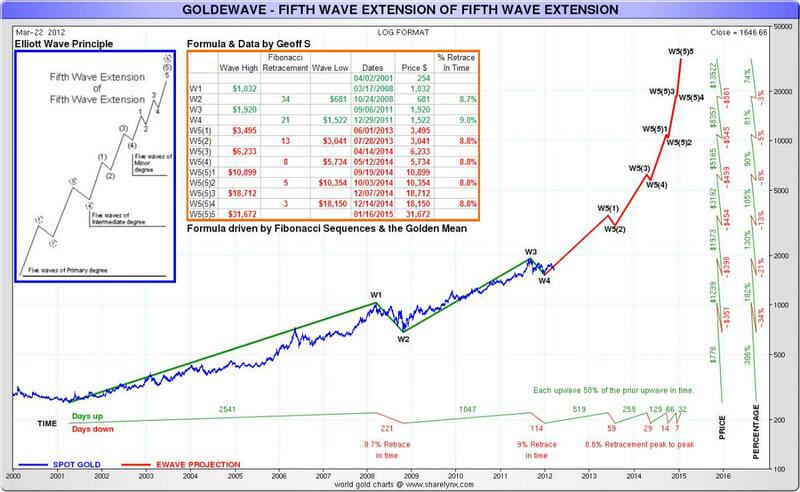 This major wave up should take us from $1,500 to $3,600 in 1.5 years. "So - a rise from here up to the old highs should occur in the next leg up. This should trigger the buy signal signaling a major move up to the mid $2,000's. A pullback and then a continued rise into the high $2,000's - low $3,000's. "So expectations are for a strong move up to be continued by strong moves - large runs up with minor pullbacks moving the market up over 100% from low to high i.e. from $1,500 to $3,500. If it does take on this stance then it will be affirmative of the plotted advance speculated on in the chart above. "If it doesn't then one can suspect that we are more likely to follow Martin Armstrong's path for gold with a soft year this year as gold gathers strength to run up from 2013 through to 2017. "At the moment I prefer my version & believe that it has good chance to play out. What the market will depend upon is any manipulation that will prevent the above scenario from playing out. "But when I look at the last 12 years I see nothing that has impeded the price and amounted to much in stopping gold's relentless rise. "So we are fast closing in on a position that if confirmed would mean that you should be fully invested in gold & ready for the rise ahead...and I still prefer bullion over gold stocks for this move up. "I'm still looking for a major bear market in equities & believe that this will weigh heavily upon gold stocks leaving few out performers. 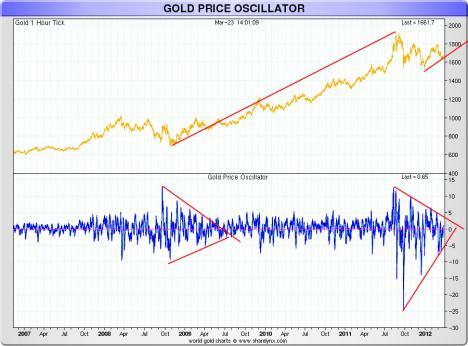 "However if we do get this equities correction then gold stocks will become a definitive buy. "So - exciting times ahead of us. NEW DELHI ­– The last two decades were the era of hypermarkets – massive superstores that could dazzle customers with an astonishing array of standardized products. But there are signs that the superstore’s age of dominance may be over. In recent months, hypermarkets around the world – Walmart, Tesco, Carrefour – have announced results that fell short of expectations. Conventional wisdom is that this reflects the economic cycle, but it may be the first sign of a more fundamental shift. The world’s economic history can be seen as a race between transportation and communications. Transportation innovations allow supply chains to carry increasingly large quantities, which thereby encourages standardization. Communications innovations, on the other hand, allow for better specification of design, quality, quantity, and time of delivery, which tends to encourage customization. The dominant economic model of any era emerges from the relative evolution of these two technologies. In ancient times, transportation technology was poor, and the production of most goods was local. Since consumers and producers could communicate directly with each other, artisan manufacturing was mostly customized. This was the age of the village blacksmith, weaver, potter, and cobbler. In the eighteenth century, shipping technology improved enough to allow the creation of global supply chains. Cotton was one of the first industries to witness this shift. Slaves from Africa were used to grow cotton in the southern United States, which was then shipped to English mills. The finished cloth was then exported to the rest of the world. The impact of this change on India’s artisan weavers and spinners was profound. It is no coincidence that Mahatma Gandhi used the hand-turned spinning wheel as his symbol of protest against colonial rule. By the early twentieth century, transportation technology witnessed major breakthroughs, including railways, the Suez Canal, the Panama Canal, automobiles, and even early airplanes. Ocean freight rates, for example, fell by 70% between 1840 and 1910. But, while improvements in transportation also improved communications – steamships and railways could also carry letters – there were few independent innovations in communications, the main exception being the telegraph. Good transportation with relatively underdeveloped communications meant that production was centralized at major transportation hubs, and production lines resembling those pioneered by the American automobile manufacturer Henry Ford were used to mass manufacture goods. Vertically integrated industrial structures were needed to minimize communication gaps between various stages of production. As mass manufacturing grew to dominate production, it was no longer possible for individual customers to specify requirements. Ford famously summarized this shift: “Any customer can have a car painted in any color that he wants,” he declared, “so long as it is black.” Retailing migrated towards large department stores that could use vast selections of standardized products to substitute for customization. Then, in the 1950’s, two further innovations – telephones and containerization – brought another round of change. The telephone had been invented in the previous century, but it was only after World War II that the price of an international call fell to a level that was affordable for common business use. Meanwhile, containerization dramatically improved the speed, reliability, and cost of transporting goods. By the 1970’s, the Japanese had combined the two technologies to modularize production and create “just-in-time” supply chains. The communications revolution of the 1990’s made supply chains even more efficient. One outcome was that hypermarkets could leverage scale, logistics, and lean inventories to squeeze prices and provide customers with unprecedented choice. Customer needs were met by providing a wide variety of standardized products – not through customization. One consequence of the democratization of communications technology is that it is now possible for customers to specify their requirements rather than hope that the available standardized products will suffice. The online retailer Amazon, for example, changed the bookstore game completely by offering almost infinite choice and large discounts. Nonetheless, first generation e-commerce still felt like a large hypermarket. At that point, it was not yet exploiting the new technology’s ability to provide low-cost customization. Today, near-customization is rapidly becoming the norm. Electronic tablets and mobile devices, for instance, allow us to access increasingly specialized applications. Similarly, YouTube has just invested $100 million to create dozens of television-like channels that will cater to audiences with narrowly defined interests. Even Amazon has gradually transformed itself from an Internet hypermarket to something closer to a clearinghouse that matches customer requests with near-customized products. We are entering an era in which it will be commonplace to order a bespoke shirt that will then be made in the cheapest location in the world. So, will hypermarkets suffer the same fate as bookstores? Some, already aware of the new reality, are investing heavily in new systems. But, even if the companies survive, the old business model probably will not. Companies and customers should prepare themselves for a new era of mass customization. Sanjeev Sanyal is Deutsche Bank’s Global Strategist.